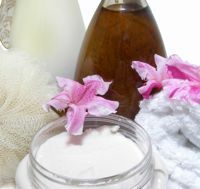 The four main types of sensitive skin are acne, rosacea, contact dermatitis caused by allergies and irritants, and burning and stinging, usually for unknown reasons. See these separate articles about acne and rosacea. Use only a gentle cleanser, once or twice a day. Avoid harsh soaps, avoid scrubbing your skin, and avoid exfoliation, all of which can make skin more sensitive. After cleansing, pat dry, leaving the skin slightly moist. Moisturize immediately. Important: Always spot test any aromatherapy recipe before using it on a large area. If you find blends irritate your skin, try testing each essential oil alone to find the problem oil. Put a drop of essential oil in 10-20 drops of a carrier oil and test it. You may also need to test carrier oils alone to make they aren't causing the problem. Combine the ingredients in a clean bowl. Pour the blend into a dark glass bottle. To use: Use a circular motion to apply a small amount of cleanser to moist skin. Rinse with warm water. Pat dry. Mix the following ingredients in a dark container with a cap. Use this moisturizer as needed. Mix hydrosols in a small, dark spray bottle. Use to lightly mist face. You can keep the toner on the bathroom counter, out of direct sunlight, for one to two months. Otherwise, store in refrigerator.